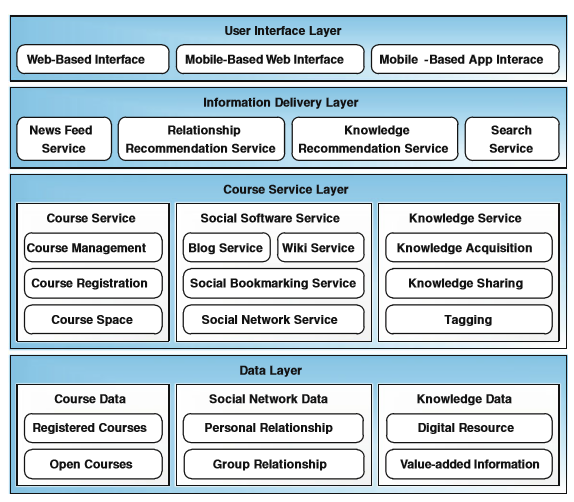 While the interaction and collaboration in traditional LMSs are largely confined to courses (Course Data), these components are typically more elaborate in social software solutions (Information Delivery Layer/Data Layer). Individual users interact on different levels and in different ways with other users and also with groups. In their paper the authors explored in great detail the specific features of social software such as blogs, wikis, etc. Actual experience, however, has shown that combining individual functionalities within use cases gives companies and employees a lot more benefits. This therefore raises the question: “Where is the gap?” Zhao and his co-authors correctly noted that these components are not linked together in most companies. E-learning must give learners the possibility to share ideas with other learners, ask questions, expand their knowledge, and broaden their network, even beyond a course’s end date. This means that, overall, most companies have already taken strides in both directions, but in most cases a linking of components as shown in the chart above still hasn’t occurred. Is the Status Quo Good Enough? Learning in many companies today still takes place outside an employee’s regular work environment. Expensive, outdated LMSs are still used simply because they are the status quo. Employees register for courses they want to attend and sign out when these are finished. Whether they offer any real, lasting benefit remains unclear in many cases. What do people really learn when they are not engaged with a topic over the long term and do not exchange ideas and information with others? SmarterPath places the focus on learners. Training is viewed as a holistic system that goes beyond allowing learners to take courses at set times and places, and integrates the learning process in their daily work. The solution addresses the different components shown in the chart and cleverly links them together, while also providing far-reaching interactive and collaborative convergence (Social Software). People are connected to people, topics, and knowledge elements within a well-structured framework. They interact with another and the system on the so-called use-case level. Examples of use cases supported by SmarterPath are the implementation of onboarding, various certifications such as sales and partners, and the building of a knowledge base. SmarterPath thus offers users an optimal learning experience through a system that unifies social software and a modern LMS according to the principles advocated by Zhao Du. Based on know-how gained from more than 100 projects, our experts have developed best practices for the powerful integration of social software and learning management components into a wide range of use cases – whether your company needs to implement complete courses (e.g. for employee onboarding) or individual training sessions (e.g. on anti-corruption) within the solution. SmarterPath connects – SmarterPath integrates.